Live in peace, plant potatoes and dream! The Moomin stories by Tove Jansson are the perfect children’s books. They are exciting, scary, comforting, funny, and at times, profound. Jansson’s imaginative fantasy world is populated with endearing characters who embody a generous philosophy of life. The young hero, Moomintroll, lives with his loving family in Moomin Valley, but their lives are far from dull, with earthquake, comet, and tidal wave all part of the regular upheavals — alongside many oddball visitors such as electric Hattifatteners, the icy Groke and manic Little My. The Moomins are a ‘small, needy brood of dreaming creatures’ as Matthew Battle says in his excellent essay. ‘A truly great book should be read in youth, again in maturity, and once more in old age’, said novelist Robertson Davies. This is certainly true of the Moomin books, which are loved by all ages — but there’s also a fascinating progression in the series which reflects the different stages of life. The first four novels are purely fun, fantasy adventures for young readers; the next two are more structured, mature stories; and the final three are quite meditative books about major life changes. As a child I favoured the exciting early novels over the serious, later stories. The first Moomin story was published 65 years ago: The Moomins and the Great Flood (1945), just released in English for the first time. This poignant little story can be seen as Jansson’s response to the Second World War she was experiencing. The Moomins are refugees from human civilisation and their father is lost. It’s the only story to explain Moomin ancestry: ‘In those days they lived together with the house-trolls in the houses of human beings, mostly behind their stoves’. The book was hardly noticed but the next three made Jansson an international success. 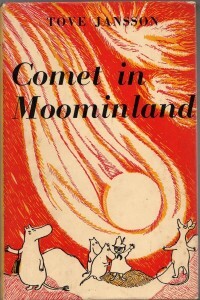 Comet in Moominland (1946) also tends towards the apocalyptic, but it has everything a younger child could want: mystery, monsters, humour and a comforting ending – ‘The comet is gone and your mother is near, to keep you from harm till the morning is here.’ The more humourous Finn Family Moomintroll (1948) introduces wonderful characters such as the Groke, the Hattifatteners and the twins, Thingumy and Bob who talk in Spoonerisms (‘Pot a wity!’). My favourite scene as a child is where a Dictionary of Outlandish Words comes to life and tiny wordlings scuttle all over the house. The Exploits of Moominpappa (1950) details Moomin back-story and with this book Jansson’s fantasy universe was now fully formed and populated. Moominsummer Madness (1954) and Moominland Midwinter (1957) are a little more down to earth stories focusing on the family dynamics. In the summer tale the Moomins face a flooded valley with their usual optimism and stage a play. In the winter tale Moomintroll shows the first signs of growing up. Alone in a frozen world he must meet various challenges without his parents, who are hibernating. 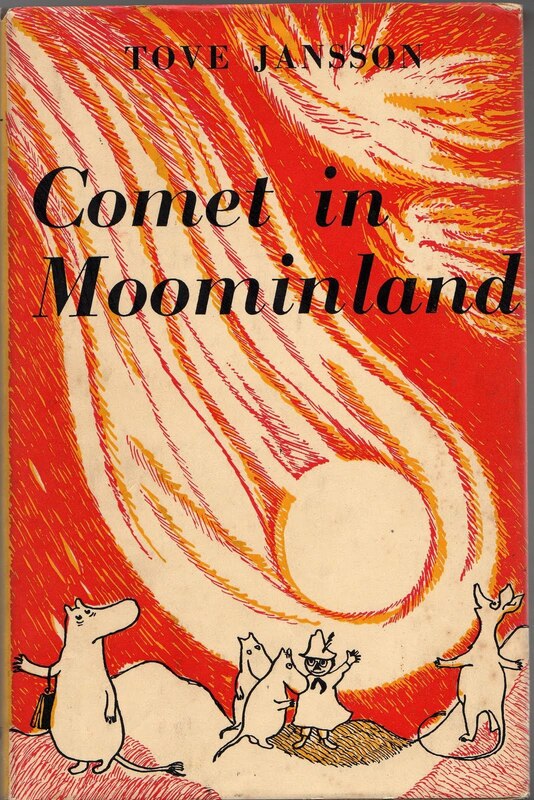 Jansson finishes the book with the words ‘The end and the beginning’, heralding a new phase in the Moomins’ lives and a change of tone in the final books. 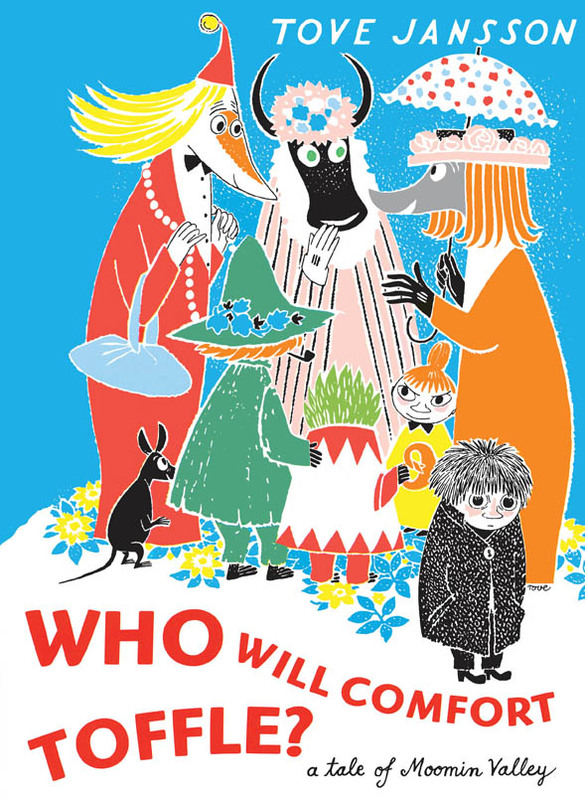 In the short story collection Tales of Moominvalley (1962) the characters are dealing with their own internal upheavals: a fillyjonk is plagued by her fear of disaster, an intensely shy, traumatised child has become invisible, and the Hattifatteners search for their feelings. When I re-read Moominpappa at Sea (1965) in my 40s I discovered what I’d missed as a child: it’s a perceptive novel about a father’s mid-life crisis (the clue is in the title!). Moominpappa has ‘no idea what to do with himself, because it seemed everything there was to be done had already been done.’ His solution is to take the family to live on a rocky island where each is stretched to their limit by the demanding environment. In the final book, Moominvalley in November (1970), Jansson tells a Moomin story without any Moomins. All the minor characters gather at the deserted Moominhouse and realise it’s time to move on without the Moomins. ‘The whole of Moominvalley had somehow become unreal, the house, the garden and the river were nothing but a play of shadows on a screen’ says one character. It’s an ingenious way for a writer to prepare her readers for an end to a continuing life their literary friends. This reflective novel was written just after Jansson’s mother died. Her father and Moominpappa both shared a love of adventure and the sea. She had two brothers and after an argument with one she drew an ugly creature on the toilet wall that would in later life become a cuddly Moomin. The name came from an uncle who told her a Moomintroll lived in the pantry, to stop her sneaking food. Jansson trained as an artist in Sweden, Helsinki and Paris, and became a well known painter in Finland in the 1940s. She always considered her art to be as important as her writing. For many years was a cartoonist for the satirical magazine Garm, where she used her primitive Moomin character as a kind of signature. Her most famous political cartoon showed a crying Adolf Hitler in nappies being fed slices of ‘Europe-cake’ by various politicians. Her vivid black and white illustrations in the Moomin novels are one of the keys to their success. There are many spectacular scenes, sometimes dark and impressionistic, where the tiny heroes are dwarfed by the landscape – witness the tidal wave in Moominsummer Madness. But anchoring the child reader is the reassuring roundness of the Moomins with their almost featureless faces. That blank canvas is important: it enables readers to project themselves onto the characters, a comic book convention that made Tintin so enduring. The live and let live Moominworld is tolerant of all types. Indeed the message is that without all types life would hardly be worth the journey. Jansson said she wanted the action in the Moomin novels to take place ‘around a family whose main characteristics are probably a kindly confusion, an acceptance of the world around it, and the very unusual way in which its members get on with each other.’ It is unquestionably Moominmamma who holds this family together. ‘She is the perfect mother: always kind, understanding, giving and forgiving, an unending source of warmth and love and food’, as Alison Lurie says in her wonderful essay on the Moomin characters. Jansson based Moominmamma on her own storyteller mother, Signe. Jansson said that ‘Every children’s book should have a path in it where the writer stops and the child goes on. A threat or a delight that can never be explained. A face never completely revealed.’ Her most memorable characters are probably the creepy, enigmatic ones. The Groke is a huge dark blob who slides around the Scandinavian landscape like a B-movie monster. She is a tragic figure, drawn to the light but unable to find warmth because she freezes the ground beneath her. The Hattifatteners are an army of white worms that spring up like fungi. They’re deaf, they don’t feel or think, are almost blind and are interested only in travelling. Alison Lurie observes that ‘the Hattifatteners irresistibly suggest mobs of packaged foreign tourists.’ It’s only in one of the later stories that they are ‘able to live at last and with great and intense feelings’. In the 1950s Tove Jansson drew a Moomin comic strip that was aimed primarily at adults. It ran in forty newspapers around the world for many years and her brother Lars took over the production in the 60s and 70s. The early strips have recently been reprinted in four magnificent hardback volumes. These are currently my favourite Moomin books, with a fine balance of humour and Jansson’s humanist philosophy. The happy-go-lucky Moomins tend to live in the moment and these stories often comment on consumerism, responsibility and work ethic. In the story ‘The Conscientious Moomins’, an officer of the League of Duty tells the family off for not making any money. When Moominpappa says, ‘We need very little,’ the officer replies, ‘As soon as you earn some, you will need it’. But Jansson also pokes fun at an overly liberal lifestyle with her story ‘Moomin Begins a New Life’. A prophet tells the Moomins that the secret of happiness is to ‘do what you want’ and when they do, their family quickly fall apart. These are Jansson’s late Moomin stories so it’s not surprising that the young Moomintroll is now keen to settle down: ‘I only want to live in peace, plant potatoes and dream!’ he says. There are also five Moomin picture books: The Book about Moomin, Mymble and Little My (1952), Who Will Comfort Toffle (1960), The Dangerous Journey (1977), An Unwanted Guest (1980), and one by Lars Jansson, Songs from Moominvalley. The Moomin books have been translated into thirty-four languages, and they’ve been made into several stage shows, including an opera. There’s also a Moomin museum and a theme park, both in Finland. Moomins are now a licensed intellectual property overseen by Tove Jansson’s niece, Sophia. The Japanese are especially taken with the cuddly Moomins — perhaps it’s the resemblance to their wide-eyed cartoons — and the characters are used commercially in Japan. The Moomin image is now used to sell toys, sweets, supermarkets and movies — which to me seems contrary to the spirit of the original stories. Jansson also illustrated editions of The Hobbit, Alice’s Adventures in Wonderland and The Hunting of the Snark. She received multiple awards including the Hans Christian Andersen Award in 1966 for contributions to children’s literature. a being seemingly composed equally of woman, nature sprite, sea creature and Moomin, whose consciousness was both exquisitely local…and generously universal. She died in 2001 aged 87 years. Thank you, Tove Jansson, for giving us your Moomin world and its whimsical creatures, a timeless gift to readers of all ages.